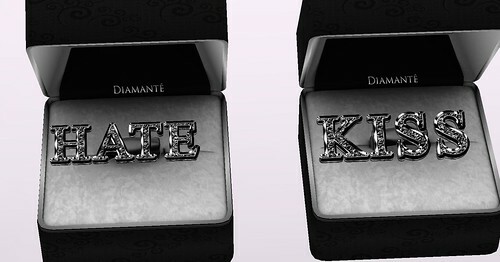 :Diamante: Kiss & Hate Ring Gachas, a photo by Alliana Petunia on Flickr. Luck of The Irish is a SIM WIDE Gacha Fair hosted by Depraved Nation. Held on the Metropolis sim, this sim wide event will house gachas from over 100 of SL's favorite brands. Gacha-fanatics should expect a wide range of items from this Gacha Fair. There were no limitations to a designers creativity here! Prepare for lag and be respectful of store owners and other gacha fans by lowering your scripts and detaching unnecessary items prior to visiting the sim. There will be a script monitor in place to assist with this and it WILL return you home if you're over the limits. Our standard opening script limits are 3 MB or 50 Scripts. Deleting scripts from clothing, shoes, jewelry and hair will help tremendously, or simply remove the items all together! You may also try a full body shopping alpha that will make you're entire avatar invisible so you won't have to worry about going bald or boobless!